[O] Do You Love Me? 10.0 0:03:34 Official CD (Various Artists - Hard To Believe: A KISS Covers Compilation , Waterfront Records DAMP121CD) • Do You Love Me? Mixed by Greg Babior, 1989. 10.0 0:04:50 Official CD ( With The Lights Out ) • Dive Mixed by Greg Babior, 1989. • Dive (instrumental) Footage shot inside the Chorus Rehearsal shows the band performing Dive. Take 1 cuts in, take 2 cuts in and out, and take 3 cuts in and out. Footage also shows the band preparing to load-out. 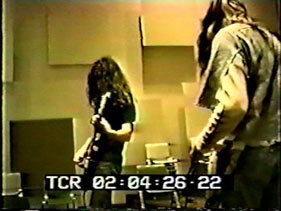 NIRVANA's only studio performance with Jason Everman. The session was produced by Greg Babior, an Evergreen student who had shared bills with NIRVANA in his own band, Lush (Babior would later found Earth with Dylan Carlson and Slim Moon). Babior needed to produce tracks for a class project, while NIRVANA welcomed free time in the college's professional Audio Studio. A video-clip from this session has surfaced, showing the band performing Dive. The video, however, is extremely poor quality and suffers from severe tracking problems.